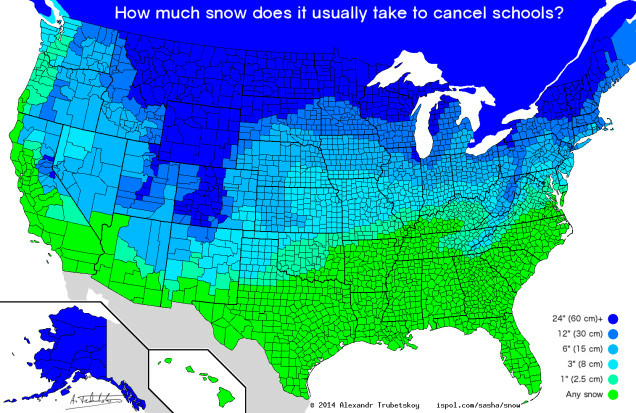 Check this map out showing how much snow it takes to cancel school by state. Click it to read the article about how it was created. Google has announced that they are ending support for Google Maps Engine (GME). If you are using GME to store your vector and raster data in the cloud, be aware that your GME data will be removed in a year on January 29, 2016. So where can you migrate your data now? Safe Software has written an article listing some options that you have. Of course if you use their FME product, it’s just a one-step process! However, besides the sales pitch, they do present some options that you have to migrate your data to. I personally have used ArcGIS Online and Amazon Relational Database Service (RDS) to store spatial data. With ArcGIS Online you have to buy a plan first, then you will consume credits when you store your data there. With Amazon RDS you can use SQL Server, Oracle, MySQL, PostgreSQL, or the new Amazon Aurora with costs for the instance (server) size/database type, consumed storage, and traffic. Keep in mind that ArcGIS Online has tools built-in to analyze and display spatial data as well as being integrated with their ArcGIS software products. Amazon RDS is just a storage solution, so you will need to come up with other options for analyzing and map display of your spatial data in the cloud, like using ArcGIS software or something else. The City of Santa Monica has a GIS Intern opening. Interns must be full time students (minimum or 9 semester or 12 quarter units). Candidates with GIS experience will be assisting in the updates of Public Works GIS databases and providing general GIS project support. The pay is $15.37/hr. For more info, view the job announcement here. Into a little history in LA County? I found this interesting map showing historic sites, old highways, battle fields, indian villages, gold mines, camps, towns, and other historical places of interest in old Los Angeles County. The map was created by George W. Kirkman and titled “The Kirkman-Harriman Pictorial and Historical Map of Los Angeles County 1860-1937”. Check it out on the LA Public Library website! If you have apps using Silverlight, this is the year to plan and move them to HTML5. ESRI plans on deprecating ArcGIS APIs and Viewers for Silverlight, and Google plans to remove support for NPAPI (and therefore Silverlight) in Chrome. Note that IE and Firefox will still support Silverlight for some time. If you have apps built on Geocortex technology, it is time for you to move to HTML5 for sure. Watch this video from a past webinar to help get your applications where they need to be for the transition. Also read this document from the webinar Q&A.